Learn Kung Fu for self defence in Exeter, Devon, in a friendly club environment. Two-hour classes run several times per week. Our instructors will take you through each move step-by-step to help build your understanding and demonstrate the truly incredible capability you will develop within the Five Pattern Hung Kuen Kung Fu system. Five Pattern Hung Kuen is taught in a traditional way; relaxed, but in an etiquette respecting atmosphere. Training is hard and demanding. It starts with a series of exercises that stretch muscles, tendons and chi meridians. The exercises develop leg and upper body strength but do not develop muscles in a 'body building' sense. Stance work based on the five animals is practised to provide the foundation framework for all techniques. As you develop your stance-work, you will learn techniques that enable you to understand the working and mechanisms of the human body; building a toolbox of strikes and techniques that can be applied with the knowledge of the effect that the strike will have. Students practice techniques on each other. Attacks and application are real. This has the benefit of ensuring that you learn techniques as they are used in the street. As a result, you will also learn what it means to receive a strike and quickly realise that you have developed an ability to withstand heavy blows. 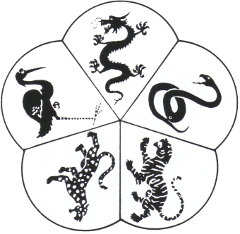 All techniques and patterns (a series of techniques and stance work combined together to make a sequence of moves) are based on one of the 5 animals within the system; Dragon, Crane, Tiger, Leopard and Snake. These are practised and used not only to develop the fighting characteristics of the animal but the chi energy as used by each animal in their specific ways. Select an animal from the image below to find out more. Powerful and penetrating. Using the tail, horns and claws in sweeping movements following the spiritual side of the animal. Included in the Dragon techniques are locks, the applications of which are designed to break bones and destroy joints. Twisting, evasive and penetrating. Snake techniques include the bite, tail and locks. Strikes are fast finding vital points with pinpoint accuracy, looking to disrupt and poison the assailant's energy. Powerful, destructive, unyielding. Tearing, ripping and driving. Tiger techniques aim to hit with such ferocity, second assailants will question their intentions on seeing the results on the Tigers first victim. Cunning, lightning speed, ripping, deceptively powerful. Striking with paws, claws and elbows. Often taking its prey to the ground, strikes are mostly focused on soft vulnerable target areas. Leopard has the ability to draw the opponent into thinking that success is imminent, only to be met with a flurry of fast deep penetrating strikes. Deceptive, elegant and graceful. Wings (hands and elbows), beak and kicks used to strike in flowing circular motions that appear to the onlooker as being flowery and faint. However, the Crane techniques to the recipient are fast, heavy and devastating. Is it good for self defence? Five Pattern Hung Kuen is ideal for self defence. That's what this martial art is intended for! It isn't about scoring points or impressive-looking high kicks - it's just about protecting yourself by whatever means necessary. No. We don't expect new members to be fit when they first join and our warm up exercises will help you shape up. It is more important to learn to use your individual strengths. Is it suitable for women? Yes - the system itself was part developed by a woman, although very few women have ever graded in Five Pattern Hung Kuen. Those who have made it think that this is the best martial art they've ever tried! The emphasis is on accuracy and timing rather than brute strength, which suits women very well. If you want to train with us long term, you will need to invest in a chest-guard. What should I wear/bring with me? Wear loose comfortable clothing. Don't wear your best clothes in case they get ripped. It's a good idea to bring some water to drink and a small towel to mop up sweat! What is a typical training session? A set of exercises to warm up, followed by drills to practise basic stances, punches and blocks. The majority of the lesson is spent practising techniques in pairs or small groups. Once the basic technique has been mastered, students are encouraged to think up their own variants and applications. To finish we might do some patterns (a bit like kata), or occasionally some sparring. The Kung Fu fighting style, Five Pattern Hung Kuen, is a traditional southern Chinese martial art dating back to the Siu Lam Shaolin Monastery and was developed by the famous nun Ng Mui and her counterpart monk Miu Hin. The knowledge of the system was then passed down through various masters. During the earlier part of the last century, Yeung Shut Fu taught it to Yuen Yik Kai, who was to become one of the most respected Kung Fu Grandmasters in Hong Kong. Sadly, Yuen Yik Kai passed away in 1984 but not before teaching the extremely rigorous training to Master Vic Gnash at Yuen Yik Kai’s school in Kowloon. Following many years of study under the Grandmaster, Vic returned to London where he opened a school and in 1971, Mike Jolliff started learning the system from Master Gnash. Mike attained the level of Master himself in 1982 having travelled to China to meet and train with Yuen Yik Kai. Mike had the privilege of training with the Grandmaster a number of times after the visit to China and has now trained two other master's of Five-Pattern Hung Kuen since Vic’s untimely death in 1996. Five Pattern Hung Kuen is based on the fighting styles of the Dragon, Crane, Tiger, Leopard and Snake. Whereby the characteristics of each animal have been honed into their own set. Each animal set can be considered as a fighting system in its own right, however, each will be lacking in one aspect or another. Consequently, only after studying the whole system of all 5 animals can a student consider that they have a complete martial art.